Orientation: May 7, 14, 21 + 28 at 10:00 a.m.
Orientations happen in room 114 of the Student Services Building. Participants must attend one. Warehouse workers move, organize and track cargo and other goods. Often, they have to move large objects using machinery, like forklifts. They inspect that equipment, set it up, then use it to put things where they need to go. They also frequently use scanners, written forms and computers to keep track of where everything is. In recent years, Amazon, Blue Apron, IGI Wax and Kohana Coffee have all opened warehouses in Richmond. But, millions of companies all over the world have storage, distribution and retail locations that need people to keep everything organized and moving. Check out our online Career Coach for more information about working in a warehouse, like how many jobs are available in this area and how much they typically pay. To get one of those jobs, you’ll need the right training and experience. You can get that right here at Contra Costa College. In CCC’s Forklift, Logistics, Operations and Warehouse (FLOW) program, you can learn how to work with equipment like forklifts and pallet jacks by using them with your own hands. 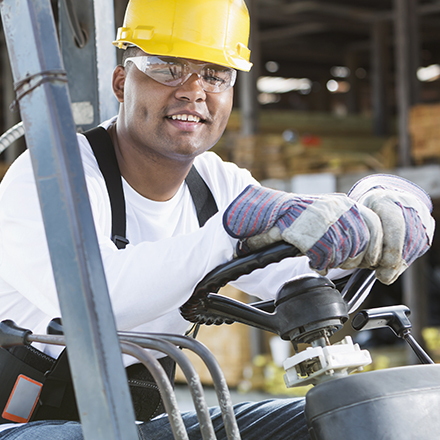 You can get industry-standard training in how to keep your workplace safe and efficient. You can visit warehouses and see how they run. You can even learn how to design a warehouse of your own. The entire program takes just eight weeks. And when you’re done, you’ll have forklift training, warehouse skills, six units of college credit and certificates in Occupational Safety and Health (OSHA 10,) professional development and handling hazardous materials (Hazmat). You don’t have to buy any books or other materials for the FLOW program, and we might even be able to help you get financial aid or fee waivers. We can help in a lot of other ways, too. At CCC, instructors, staff, counselors, tutors, and fellow students all have your back. We even have a career center to help you find jobs, apply and prepare for interviews. In fact, many FLOW students leave our end-of-program hiring event with job offers. Our current industry partners include Amazon, Chevron, IGI Wax, Safeway, Kohana Coffee, Whole Foods, Williams Sonoma, Matson, Dreisbach, Express Pros, MTS Transportation, Surplus Services and Bay Area Beverage. They all help keep the program going, up-to-date and connected with job opportunities. If you’re interested in taking part in the FLOW program, you should download an application packet and contact our Career Pathways Manager.